Boudicca, with her long red hair. Boudicca is the archetypal British warrior woman and I have always wanted to know more. To the extent that I was even willing to go to a, wait for it, Conservative event to hear a talk about her. Ms Canal Explorer accompanied me to the House of Commons. We were both rather nervous, having spent most of our lives hanging out with lefties and anarchists. You know that hackneyed phrase “some of my best friends are Jews or Black”? Well none of my friends are Conservatives. To be right of centre in arty circles verges on the socially unacceptable. The House of Commons is awe inspiring; from the enormous medieval stone halls with paintings of King Arthur on the walls to the white shirted and tailed ushers to the dark green seating. I can imagine visiting foreign dignitaries must be overwhelmed. Especially compared with today’s inauguration which, frankly, to me, looked like a parade from Disney’s Main Street, in spite of the heightened emotion. Entering the room where the talk was to be held, my first impression was that they looked like Tories; old ladies with Margaret Thatcher hairdo’s in Jaeger suits who’d gone up to town, younger men with short back and sides in suits, shirts and ties, there was even a child there. I thought “they even bring their kids to Conservative events”. Youth and Conservatism seem an anathema. The speaker Rupert Matthews is an author and Conservative Euro M.P candidate. Strangely for a Conservative, he is interested in occult phenomena particularly UFOs. I asked him what he thought about the recent tentacled UFO sighted in the UK. “Well, of course I was very excited, who wouldn’t be? But I’m afraid I don’t think it’s genuine. It doesn’t fit into the pattern”, he replied. We don’t really know how the Celts pronounced the original name of Boadicea, which is the Latin translation of her name, but historians have surmised that she was called Boudicca.The reason why Boudicca is still remembered is because her story, the ruthless nature of the battles, were unusual. Her tribe, the Iceni, from today’s Norfolk, would have little wars every 3 to 4 years. These skirmishes were fun, profitable for money or slaves and a chance for ambitious young men to earn glory before the King. Celt society, whilst hierarchical was also socially mobile. An act of bravery on the battlefield would transform the fortunes of a family. The general scenario of a battle would be thus: there would be infantry and also chariots, which were not a weapon of war but a chance to show off. For this reason most Celt battles took place on flat open land where chariots could easily gallop at full speed towards the enemy with flashy warriors doing handstands and balancing acts on the horses whilst throwing spears. The side that did this the best would demoralise the other side who would then run away. After that a few families would switch allegiance. Some people were killed but not many. The ambition of Celt youth was to afford a shield, a spear and a sword which would enable social advancement. The Romans however were professional soldiers. They fought to win, to take land. They wanted to conquer Britain. Boudicca, 45, was royal; she became leader of the Iceni on the King, her husband’s, death. This king left his realm and his land to his two daughters but also left some land to the Roman Emperor Nero in an attempt to soothe. The Romans did not believe women should inherit land or be leaders. At the time there was a new governor, Suetonius Paulinus, who went off to conquer Wales leaving the situation in the hands of his procurator (or treasurer) Catus Decianus. This procurator was corrupt and greedy. He entered Iceni land with Roman soldiers where they took whatever they wanted. When Boudicca objected they flogged her, tied her up and raped her two daughters. This caused outrage. To treat royalty in this way was sacrilege to the Celts. The priesthood, the druids, also felt their gods were being insulted. The Celts reacted with fury. They first attacked, led by Boudicca, the Roman fort of Colchester. Every Roman citizen was murdered or raped. Rather than march straight to London, Boudicca decided to attack the 9th legion, about 6000 men, on their march southwards. Again it was a rout. Nobody in the legion survived the slaughter. This was shocking at the time. The unruly Celts massacring a professional legion. Boudicca was a very good commander who managed to keep control of the Celts. Next stop was London where Boudicca triumphed again killing each man, woman and child, burning every building down. Heading up Watling St. (where I live) her army did the same in St. Albans. This was a war for revenge, not fun and profit. There was no looting. Finally Suetonius returned from Wales and took the Boudicca threat seriously. By now the Celts numbered 250,000. They outnumbered the Romans by 4 to 1. It is believed that Suetonius made his stand near Birmingham. He used a clever strategy. Knowing how the Celts fought their battles, he surrounded them in a U-shape. The Roman soldiers had enormous shields and the Celts simply could not penetrate the front line wall of soldiers. When the Celts realised they weren’t going to win, they, as usual, ran away. However, and they did not expect this, the Romans tracked them down. Knowing she was defeated Boudicca took poison and committed suicide. She knew her fate if she was captured by the Romans. She would have been taken to Rome and tortured in public. After the rebellion the governor killed anyone who had joined the rebellion. The newly appointed procurer, said if you kill them, we can’t tax them. So a new governor was sent from Rome who spent the next 5 years, ‘winning hearts and minds’ of the Celts. This worked very well to the point that Britain became the last outpost of the Roman empire, even after Rome had fallen. Afterwards in the pub, I discussed with Rupert how Britain has always been comfortable with female leaders; Elizabeth I and II, Margaret Thatcher, Matilda, Victoria to name but a few. In France they had the Salic law, which prevented females from inheriting the throne in their own right. And whatever you think of their politics, look how America has responded to Hillary Clinton and Sarah Palin. 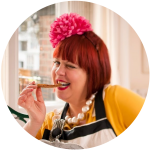 Great blog Ms Marmite Lover – Boudicca is fascinating! Alex Kingston played her in a little TV drama a few years ago. Didn't get great reviews but I thought it was pretty cool. Did you see it? This evening was interesting in 2 ways. First, I knew absolutely nothing about Boudicca, not even what country she was from, so I found it enormously inspiring to hear of such a strong and powerful female leader. I got goosebumps when I heard about how she led the masses to kill every last person in London and burnt every building to the ground – no looting, this was for REVENGE. I think women have an inner rage that once unleashed is virtually unstoppable. Men take heed – don't mess with a lioness protecting her cubs!! The other thing that was mind broadening about the evening was to go and mix with the 'enemy' – a roomfull of overt tories. Remember, this is not those individuals casting a misguided Conservative vote without really thinking about the implications, but those making a conscious and active political decision to become involved with Conservative activities. My preconceptions were challenged. The child was obviously there to learn for his history project, and why not? We met people with whom we shared mutual friends. One lady was a herbalist and I spoke to her about my mysterious warts. An Asian lady who lived close to Marmite Lover wanted to be friends so that they could share information about (Conservative) activities in their local area. One man was from Bolton and we bonded over our northern roots; he gave me his card and told me to look him up on facebook. I dived straight in and asked some of them why they decided to be tories. I heard one tell Marmite Lover "well… I've always…. erm…". Another declared his belief in the Free Market. Then I bit the bullet and brought up the racism issue – I had always seen right wing politics as synonmous with biggotry. Not so, said one tory in the pub. The BNP are extreme left socialists, true Nazis he said, offering excellent services and so on to the majority, but with certain groups excluded. He had a point. Apparently many of the immigrant business owners in the East End are Conservative by their nature and the party see this social group as a major opportunity for winning votes. Again, surprisingly, he had a point. My mum had always told me about politics being like a circle – the extreme left and the extreme right are very close, and by the same token the moderate left and the moderate right are also very close. I thought we were quite radical, a couple of leftie anarchists 'infiltrating' the tory event. I discovered to my astonishment that some of them were very easy to get on with and actually the sort of people I would be friends with if I had met them in another setting. This reminds me of the Space Hijackers project Midnight Cricket, Anarchists Vs Capitalists. Let's acknowledge our differences, bust those preconceptions and start to break down the barriers by finding common ground and getting to know each other as individuals. Awwww – and a big rainbow of peace breaks out across London. The outcome of the cricket… city boys playing ball games in the road, bouncing on street-furniture, partying to illegal soundsystems, getting moved on by security and police, and dancing their hearts out at impromptu 6am circle line parties…. victory to the anarchists that one, I think. Boudicca's (Sometimes "Boadicea") name is a Latinization of a Celtic word. I don't know what that word was but in the British-Celtic language's modern descendant, Welsh, it is "Buddug" (Pronounced "beetheeg"). It means "victory". How strange that 1800 year later we would have another queen with that name, Victoria. I wonder if that grave under Kings Cross really was Boudicca's. Like King Arthur she's supposedly buried in many places and we may never find her true resting place. Glad you enjoyed your night with the "Tory wankers!" Actually I prefer the Conservatives to the New Labour crowd! They're certainly more right-wing than the Conservatives! Dean, I saw that film. It got crap reviews, but I thought it was pretty good. It portrayed Boudicca in a very favourable light, painting the Romans as demons and omitting Boudicca's own brutality. The Romans WERE demons; what they did to Boudicca and her daughters they did every day to many people, but as is often the case, history is not black-and-white. Dean, welcome to my blog. Yes I did see that drama, although it was a bit clumsy I still found it gripping. Actually it was a female conservative that said to me "I'm a conservative because I believe in the free market." I gaped at her. "Even now?" "Well, I suppose the banks haven't handled things as well as they could have, they were greedy" she continued. "They've been a disaster. Gambling! The city is no more, no less than that. The free market has decisively been proved unworkable." I fumed. Ben, nice point about 'Buddug' meaning Victory. Boudicca is also rumoured to be buried on the mound at Hampstead heath. The difference between the Kings X find and other Celt burials is that this is the only one which can be proved to be a woman, the others were either men or the skeleton had disintegrated to a point in which it was no longer identifiable. Thanks for the info, ML. I'm afraid all the gender of the skeleton proves is that the grave is not Roman. Rome was a very male-dominated society and women had little or no political power. The idea of a queen, or any kind of powerful female, was alien to them. This is why when Presutagus died they refused to acknowledge Boudicca's soverignty and tried to take over the Iceni lands and administer them directly (It was similar with Cleopatra. Also, some say Presutagus was murdered, if so it was probably by a Roman secret agent. In the film it was Magior the Druid). Celtic society was very different to the Roman one in that respect. Women were equal to men and often became warriors and chieftans. There remain cultural echoes of this today, and anyone who's met a Welsh Mam will know what I mean! You don't moan at them if they burn the toast! Under Celtic inheretance law a man's estate was divided between all his children (This law survived into the Middle Ages as Welsh Law), so when a king like Presutagus dies his wife automatically becomes queen. Roman law was very different; the crown never goes anywhere near the head of his consort and passes directly to his eldest son. Maybe that grave in Hampstead is Boudicca's, but then again it could be any female ruler because there were plenty of them in those days. Interesting thing about the statue of Boudicca. When I was a kid (in the 1960's), the caretaker of Bunns Lane Works (where my dad had his business and I've got my studio now) was an old guy in his 90's called Sam Furnaux (think thats the spelling). He told us that as a young man he worked on the gang that installed the statue in London. He said he worked on a few statues but people were far more interested in Boudicca than any other one. Even in his old age he would go down to look at it and admire his work ! As a result I always felt an affinity to the statue. My brother took a picture of it, got it framed and gave it to him for his 100th birthday in a care home. He cried and said it was better than the telegram from Liz II. Yes Boudicca is still meaningful to people…David and Goliath plus the fact that she is the original British warrior woman. Maybe that's why the tories like her?